Halfmoon Biosciences is a small consultancy firm specialising in servicing the environmental monitoring needs of the offshore Oil and Gas Industry. Halfmoon Biosciences has successfully managed the transformation from a research based role to one that successfully provides practical management outcomes for their clients. We are currently the only team specialising in developing and implementing seabird surveys for industry in Western Australia. Halfmoon Biosciences also provides Environmental Representation on offshore construction projects, and develops monitoring plans for native and introduced terrestrial wildlife. Halfmoon Biosciences has been engaged by Apache Energy, Chevron, Woodside Petroleum, Origin Energy, Vermilion Oil and Gas, Tap Oil, BHP Billiton, OMV Australia, Shell Australia as well as the Federal Department of Environment and Heritage, State Department of Fisheries and the Department of the Environment and Conservation (formerly CALM), Murdoch University, University of Western Australia, the Australian Institute of Marine Science (AIMS), Latitude fisheries and CSIRO. Halfmoon Biosciences staff are internationally recognised for their work on the impacts of climate change on the delivery of piscivorous prey to seabird communities in the Eastern Indian Ocean. A list of recent publications may be found at News. Long-term seabird island monitoring projects across the North West Shelf for Apache Energy Ltd.
Marine fauna-based aerial surveys and baseline monitoring of seabird/shorebird habitat in the Exmouth sub-basin for Apache Energy Ltd. Implementation of an Operational Scientific Monitoring Program (OSMP) for AIMS and Shell Developtment (Australia) Pty Ltd. Operational advice to Murphy Oil for Oil Spill Contigency Planning, Houtman Abrolhos. Baseline invertebrate monitoring for Apache Energy Ltd.
Vermin monitoring on Lowendal Islands for Apache Energy Ltd. 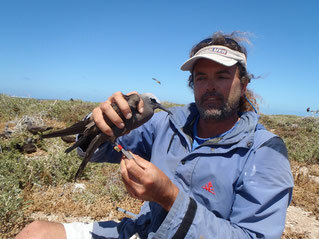 Long-term Lesser Noddy and seabird community/feeding ecology at the Houtman Abrolhos. Rat Island recovery project, Houtman Abrolhos - community-based for NACC, Geraldton.